20Hz-1MHz, LCD Display, 0.1% Basic Accuracy. The LCR-8101 1MHz precision LCR meter provides accuracy and versatility for a wide range of component measurements, even including DC resistance measurement and Voltage/Current monitoring. High resolution and accuracy provide precise measurement results which help reconstruct component characteristics. The Multi-Step function allows customized measurements with Pass/Fail tests all according to a user’s requirements. Parameters and limitations are defined separately for each program step. 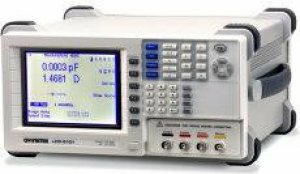 GPIB and RS-232C interface are installed as standard features for controlling the instrument and reading the measurement results. The Optional Graph Mode can display component characteristics in graphs over a wide frequency range or for different driver voltages. The rich features of the LCR-8101 lighten your measurement workload at a very competitive price.